Get ready to switch plans by archiving classes and tidying up your teachers list. 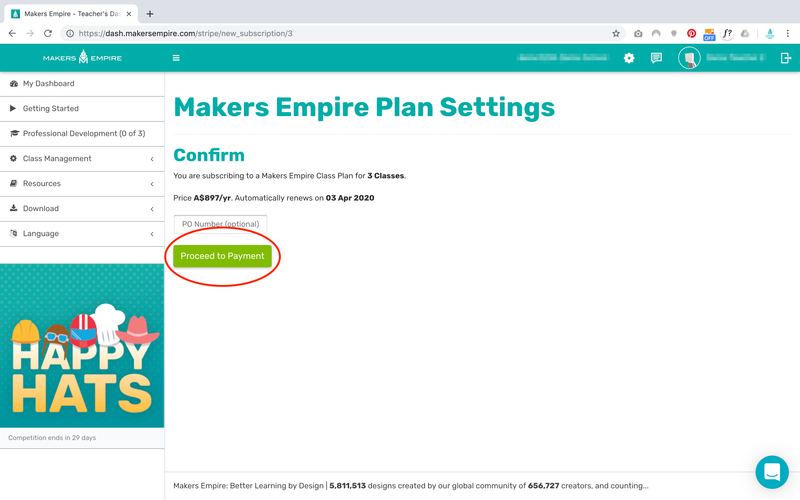 If you are swapping from a Makers Empire School Subscription to Makers Empire Class plan you might need to take care of a few admin tasks first. The key point to remember is that one Makers Empire Class plan includes: 1 class, 2 teacher accounts and 30 student accounts. 2. Manage the number of active users on your account, e.g. if you have 85 students but wish to purchase only 1 x Makers Empire Class plan, you would need to archive 55 students. Only the billing administrator at your school can join or change your Makers Empire Class plan settings. If this is not you, we'll let you know who to contact. 2. Select the number of Makers Empire Class plans you wish to purchase and click the green Join Now button. *NOTE: if you need to include a purchase order number, you can click "Generate my instant quote" and then enter your PO number during the next step. 3. Confirm that your order is correct and click the green Proceed to Payment button. 4. Enter your billing details and press the blue Pay $.... button. 5. You will receive confirmation if your payment is successful, or details on what to do if your payment is not successful. 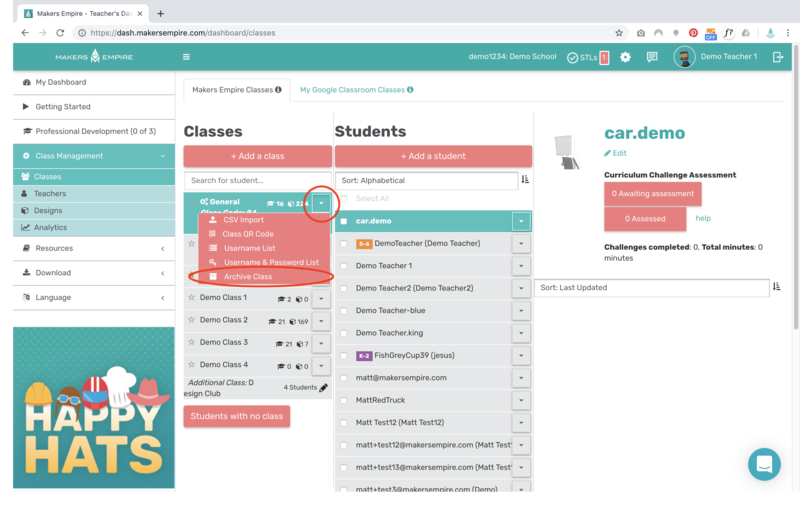 Depending on your school's current usage, you may need to reduce the number of classes, active teacher accounts and/or active student accounts when you swap to a Makers Empire Class plan. Alternatively you can purchase multiple Class plans. 1. Archive your extra classes. 1 x Makers Empire Class plan includes 1 class. If you currently have more than 1 class in the Teachers Dashboard, you may need to archive some classes. 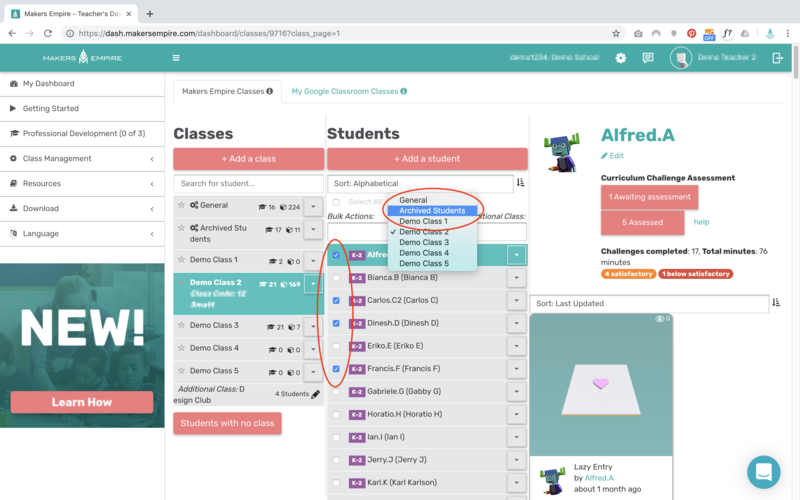 For example, Makersville School currently has three classes in the Teachers Dashboard but wants to purchase a single Makers Empire Class plan; they will need to archive two classes. To archive a class, click the down arrow next to the name of the class, and choose Archive Class from the dropdown menu. Click here to learn more about archiving classes. 1 x Makers Empire Class plan includes 30 student accounts. Once you have the correct number of classes for your plan, you will need to ensure that each class has no more than 30 student accounts. If you have a class with more than 30 student accounts, you can archive individual student accounts by first selecting the students whom you wish to archive, then clicking Move Students: Archived Students. *NOTE: Archived student accounts, including a student's work and progress, can be retrieved if you choose to upgrade your plan in the future. 1 x Makers Empire Class plan includes two teacher accounts. If you have more teachers than your plan will allow, you need to delete some teacher accounts. Teacher accounts can not currently be archived. To delete an extra teacher account, click the pencil icon next to their name and email address, then simply click the turquoise Delete button. Once you've completed these three steps, you're ready to use your Makers Empire Class plan!